In Dubai, a city akin to Las Vegas without sin, the boyfriend and I found something unexpected: an artistic, unassuming restaurant serving pan-Arabian vegetarian food worth twice what we paid. Not sin, but not unlike it. We had been increasily weary and hungry, walking along the Dubai Creek under the midday sun, and ground to a standstill outside a government building and a mosque. Neither promised respite for two pale, agnostic, famished civilians. Forcing ourselves onward, around a bend in the creek, we walked straight into the Old Dubai complex that harbours the Al Fahidi neighbourhood. This cool stone warren of walls and pathways guided us through artworks and smelled vaguely of coffee. 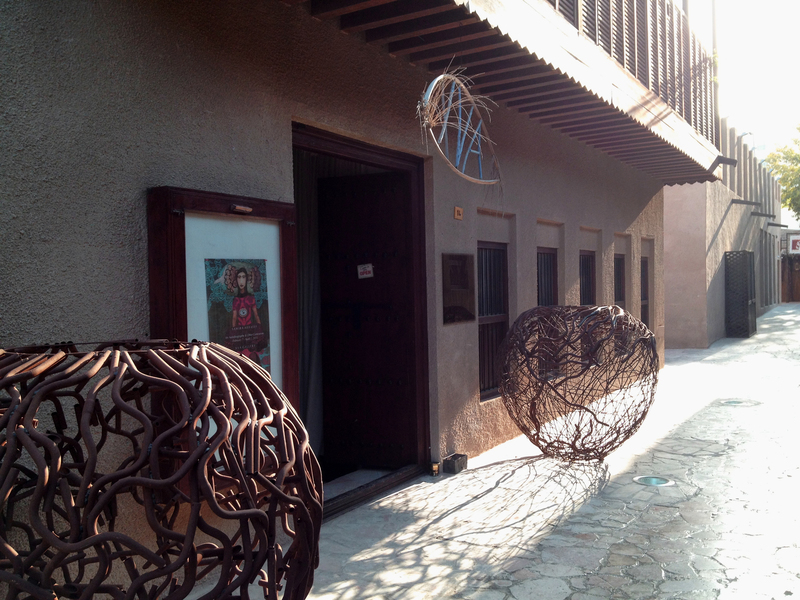 We wandered into the heart and discovered the exquisite XVA Cafe, hotel and galleries, nestled among other restaurants, a coffee museum, and Dubai’s architectural society. The cafe is in airy courtyard shielded overhead by long, billowing strips of fabric. 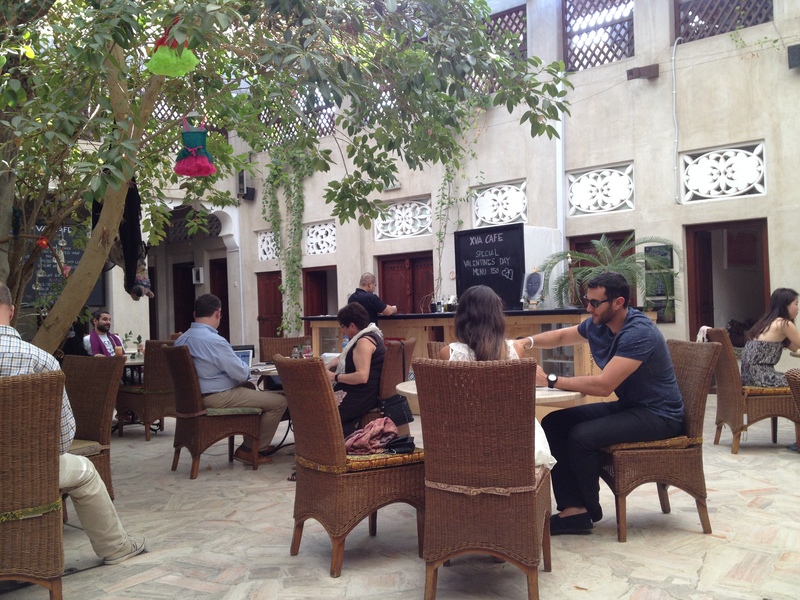 The Arab sun, even in winter, can be keel-inducing, but here ex-pats, locals and tourists alike languoured comfortably at wood and rattan tables and chairs, reflecting the calm of their surroundings. A tree in the courtyard’s centre had become the site of an art installation; small colourful dresses hung from its branches. In fact, artwork was everywhere to be seen, along the outer perimeter of the courtyard—in galleries and shops toeing the line between Middle Eastern and American sensibilities. XVA’s owner is an American, and I imagine she sensed a need for somewhere breezy, light and inspiring in a city dominated by, on the one hand, glass and steel, and on the other, ornate Arabian decor and the thick smoke of shisha pipes. I asked for a mint lemonade, and our waiter smiled shyly, pointing at our placemats. Turns out my random choice has widespread appeal: the placemats were laminated pages from the XVA guestbook that bore several scrawled love letters to the epic lemonade. 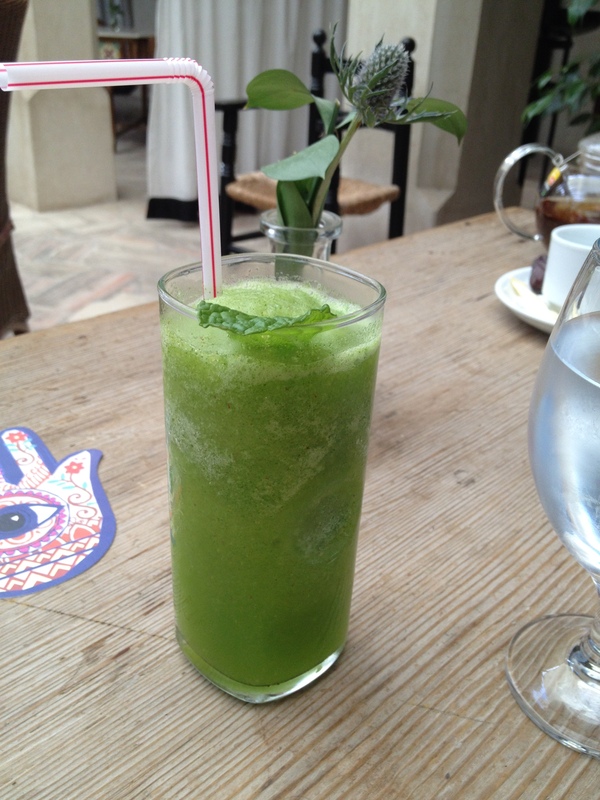 Vivid green rather than yellow, this nouveau slushie came with a whole mint leave surfing its icy peak. Despite the intense colour, the flavour was somehow delicately lemony and a perfect blend of sour and sweet. Vitality restored! 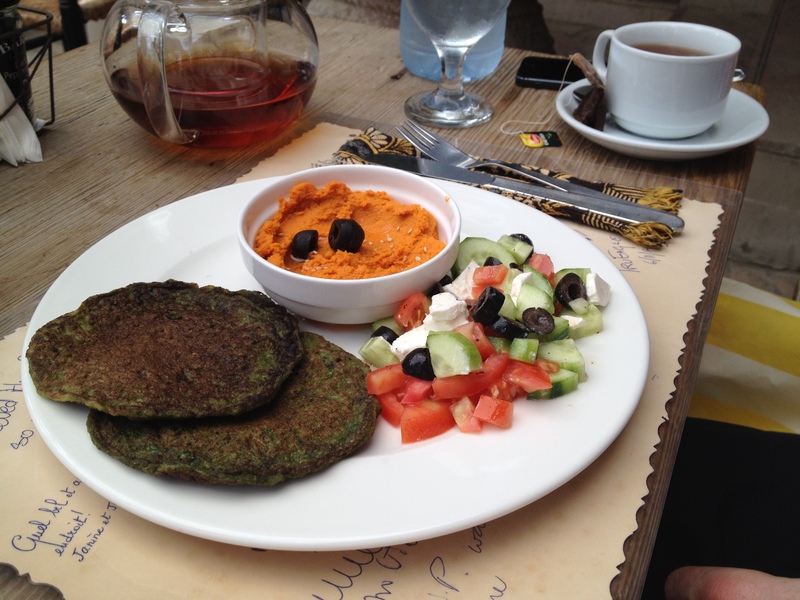 For a light lunch I chose the tabbouleh and, on the side, caramelised-onion hummous and pita bread, which was more than enough for an average-sized, albeit exceptionally hungry, patron. Homemade hummous was also on the boyfriend’s plate—the red pepper variety—and both kinds were far superior to any I’ve tasted outside the Middle East. His order was bean-cakes, resembling two smooth, charred pancakes and boasting a tender bite with beautiful seasoning. A salad of feta, cucumber and tomato sat side-saddle on his plate. Meat seemed quintessential to nearly every other restaurant we visited while in Dubai. But at XVA, the abundance and freshness of cuisine would leave only the most cavernous carnivorous appetite unabated. And for us—staunch vegetarian sympathizers—XVA was like finding Mecca. Service was flawless, and we spent a happy half-hour undisturbed after our meal…sitting back, feeling a light breeze, gaining back our strength. It was Valentine’s Day, and although that fact had escaped us until we saw the staff setting up decorations for dinner, we felt justifiably romanced. I would have chosen no other setting for an intimate meal far from home. This entry was posted in Restaurants, Travel and tagged Dubai art hotel, Dubai gallery, Dubai restaurant, mint lemonade, XVA, xva cafe by aquixie. Bookmark the permalink.